Zombies? Fuhgeddaboutit. The Squirrels Are Attacking! Run! Ashburn [Virginia] , Partlow Road, Oct. 21. 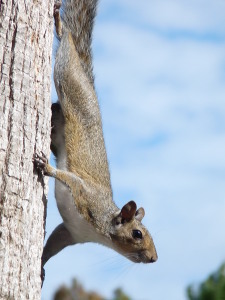 A caller reported that a squirrel was chasing and attacking children on a playground. An animal control officer observed the squirrel gather food and store it under a swing set. There was no sign of aggression. The officer told people there about wildlife hibernation habits. Too much coffee? Too much TV? Too many shrooms? Anyway, here’s the source.